For marinade: Whisk together all marinade ingredients in a bowl until well blended. Pour into a large resealable plastic bag; add the shrimp. Press out all of the air and seal the bag, turning it gently to coat evenly. Refrigerate for 1 hour before cooking. Skewer 3 to 4 shrimp on each skewer. 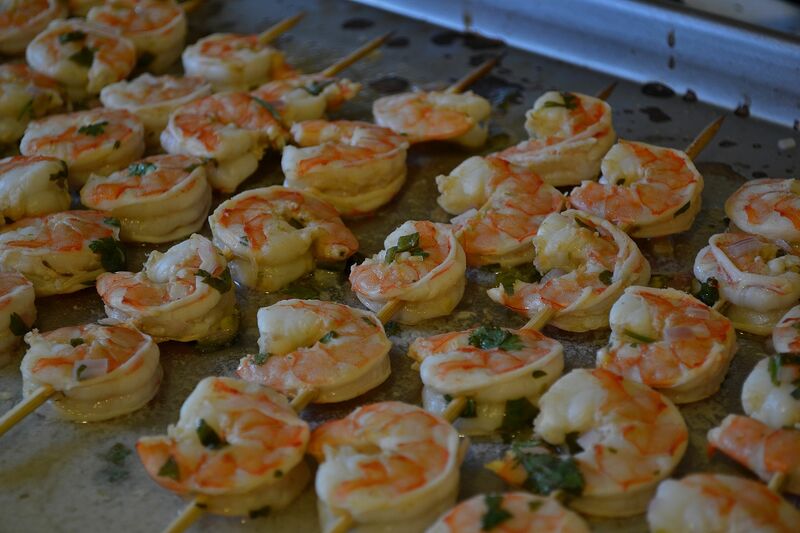 If grilling: Cook, uncovered, on preheated grill until shrimp turn pink, turning once, for 5 to 7 minutes. Serve with lime wedges. If broiling: preheat oven briefly to broiler mode, and place skewers onto a broiler-safe pan. Cook for 5 to 7 minutes (depending on size of shrimp), turning once. Serve with lime wedges. NOTE: shrimp can easily be cooked over a stovetop – after removing shrimp from marinade (and discarding the remaining marinade), add to a large skillet with a touch of oil and sauté for 5 minutes or so.